LAS VEGAS – What if you could scan a piece of cheese to discover its caloric content or a stray pill to figure out if it’s a vitamin or your pain medication? It sounds like something out of a sci-fi movie, but it's a feat that’s already possible thanks to a tiny device called SCiO. After raising close to $3 million on Kickstarter last year, the company showed off a prototype of its molecular scanner this week at the Consumer Electronics Show in Las Vegas. Since its time on Kickstarter the device has gotten even better. "SCiO’s current design incorporates more features and increased functionality than the original molecular sensor we promised," says Dror Sharon, CEO and co-founder of Consumer Physics, the company behind SciO. The device is about the size of your average Zippo lighter and scans food when you press a button its side. SCiO analyzes whatever you have it pointed at on a molecular level and then reports back its findings to the scanner’s app. Details include not only what something is but also its nutritional information. Since Kickstarter, SCiO has added a remote temperature sensor, a protective cover that pulls double duty as a calibration mechanism and a new light indicator on the activation button to let you know a scan is underway. That learning is an important piece of the puzzle. In order for SCiO to accurately scan something, it will need to have scanned it before and have the item in its database. Once it’s saved, it can always identity that item in the future. 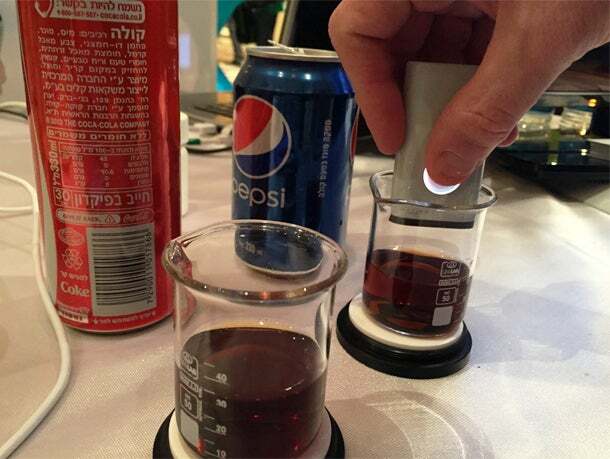 It can even tell the difference between Coke and Pepsi. The more people who use SCiO the greater that database will eventually become. SCiO is currently available for pre-order on the company’s website with as estimated ship date of July 2015. Just the scanner is $249 while the device’s software development kit is $449.